The remote execution (or triggering) of IT jobs or IT automation runbooks from a smart device is the fastest way to neutralize or even resolve critical IT issues – especially when those incidents happen outside of business hours. Wherever an IT admin or on-call person is alerted, he or she can immediately respond and take action, without being dependent on console or virtual desktop access. Analyses runbooks can also help to get in-depth information about root causes or affected systems. This functionality can be very effective and helpful for making sure mission-critical IT systems are up and running 24/7. On-call people do love it. Even at the supermarket cashier, you can pull your smartphone out of your pocket and take action. However, we know that allowing the executional access to IT infrastructure is a serious endeavor and various security concerns are related to it. In many enterprises this great functionality is blocked by security policies. And there is a lot more to consider. ﻿﻿An increasing number of vendors of notification and incident management solutions claim to offer mobile runbook execution as it has become state-of-the-art feature. But let’s look behind the shiny marketing curtain to see what it takes to actually live up to the promise. Based on our experience there are at least 3-4 major prerequisites such solution needs to fulfill before it can be seriously considered for deployment. In 2011 we introduced “remote actions” in Enterprise Alert and we know the challenge to address these requirements properly. ﻿﻿﻿﻿﻿﻿First of all, a viable solution needs to seamlessly embed into your existing IT automation environment. Why? It is likely that your IT automation infrastructure is already there. Or you wish to use genuine IT automation software like HP Operations Orchestration or Microsoft System Center Orchestrator which are fit for purpose. Some notification solution vendors ship their own proprietary automation software but this is a disadvantage in two regards – you need to get familiar with another system for IT automation and you cannot use what’s already there (migration is sheer impossible). In this regard, Enterprise Alert is a unique lightweight solution built on plug&play product connectors, e.g. for HP OO, SCO or even Windows Task Scheduler. 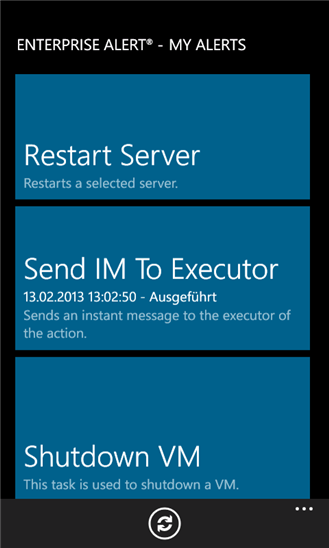 You can simply continue working with any runbook you’ve already created and make it available for remote execution, e.g. from a smartphone. Secondly, there are serious security concerns. A solution enabling remote & mobile runbook execution needs to address the potential danger that comes with remote access to the inner core of your IT. Enterprise Alert comes with a unique security concept. Any communication between the Enterprise Alert smartphone app goes over an SSL-secured connection and via a DMZ proxy. On-top it is privately encrypted. In Enterprise Alert, runbooks from 3rd party systems are provisioned on a per-user basis limiting the potential misuse and minimizing the impact of security leaks. So, with Enterprise Alert you won’t have ad-hoc access to all existing runbooks. Additionally, any remote runbook execution requires entering a PIN further enhancing security. Even if a potential hacker got hold of the mobile device and somehow managed to bypass the device’s and the app’s login mechanism, he can still not execute runbooks without the security PIN which is not stored on the device. Thirdly, complete audit trailing of runbook executions should be a matter of course. In many industries there are compliance and documentation regulations that demand a detailed log of such actions with mission-critical impact. Enterprise Alert delivers here. And additionally, if alerts in 3rd party monitoring systems are closed as a result of the executed runbook, this is synchronized to the Enterprise Alert smartphone app or notified otherwise, all thanks to the 2-way integration concept of Enterprise Alert. The whole software is deeply and seamlessly embedded into your existing IT environment to make sure you get the best of both worlds. No doubt, “remote runbook automation/execution” is one of the greatest tools for fighting unexpected downtimes and to improve business continuity. But the above listed prerequisites are simply the minimum to ensure operability, to prevent security leaks and to making it truly effective.